Lynch's book tells how TM helped him as a director (Eraserhead, Blue Velvet, Mulholland Drive, Inland Empire) and is interspersed with anecdotes. It was a triple-pronged event at the French embassy residence at a benefit for the hurricane-damaged New Orleans Museum of Art. The combined artistic knowledge of the small group of museum directors, curators and connoisseurs from around the country and abroad could fill volumes. They were especially attentive as Ambassador Jean-David Levitte opened with a witty and historic three-era tour of U.S.-French friendship, as shown by the embassy's paintings, tapestries and furniture in three era-themed main rooms. He and his wife, Marie Cecile, along with the French minister of culture, were scheduled to open an exhibit of 83 paintings, Femme, Femme, Femme: Paintings of Women in French Society from Daumier to Picasso, on loan from 45 French museums to the New Orleans Museum, to the joy of its director, E. John Bullard, who also spoke. In turn, Bullard loaned a 1788 portrait of Marie Antoinette to the Palm Beach/America's International Fine Arts and Antique Fair, said Dr. Michael Mezzatesta, the fair's director. For the embassy evening, Hillwood Museum supporters partnered with the cosponsoring Palm Beach Fair at the suggestion of John Francisco Andreu, who served as the fair's consulting curator. Pierre Arizzoli-Clementel, director-general of the museum at Versailles, introduced California collector Marylou Boone, who charmed listeners when she described her passion for collecting French ceramics. She said that as a would-be collector seeking guidance, when she was told "Consider faience," she had to ask, "What's faience?" Now that she is a recognized authority, her tales of sleuthing out rare examples showed that Marylou learned well. Breakfast at the Library of Congress drew Debbie Dingell, Rae Brown, Jan Staihar and other can-do supporters to hear Nancy Brinker's 25th anniversary update on the Susan G. Komen Race for the Cure Foundation. Nancy's promise to her late sister to work for an end to the disease that took Susan's life has launched a global movement of millions working to fund research, support survivors and emphasize the importance of early detection of breast cancer. The June 2 race in D.C. expects 50,000 participants, with a minimum of $1 million in proceeds. If it's a party at Giorgio and Anna Maria Via's, expect wallto- wall diplomats and cultural committee co-workers. Their reception honoring two couples, the Ambassador of Chile Mariano Fernandez and his wife Maria Angelica Fernandez, and the Finnish Ambassador, Pekka Lintu, and his wife Laura Colless was no exception, with nine ambassadors and friends from The Washington National Opera, Washington Performing Arts Society, Washington Ballet and The National Museum of Women in the Arts ... A soldout house greeted the Russian Chamber Art Society when founder Vera Danchenko-Stern accompanied renowned baritone Sergei Leiferkus, with Helene Tartakowski commenting the dramatic musical Tribute to Feodor Chaliapin at the Maison Francaise auditorium. SEEN: Svetlana Ushakova, wife of the Russian ambassador; Russian cultural attachÃ© Irina Popova; and Jerome and Lisette Barry of the Embassy Series of musical events. 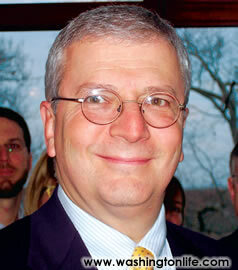 JOSH BOLTEN, White House chief of staff, at a reception held at the home of Jim Kimsey celebrating the work of the Center for International Education, which educates children for responsible world citizenship. 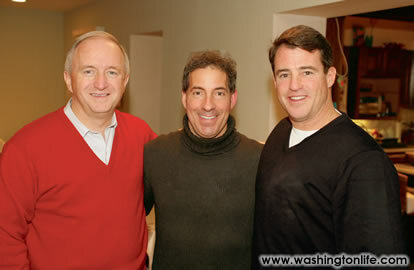 TERRY LIERMAN, JAMIE RASKIN and DOUG GANSLER celebrate Raskin's birthday at John Simson and Elise Riley's residence. The party had a political murder mystery theme with guests trying to identify the culprit. 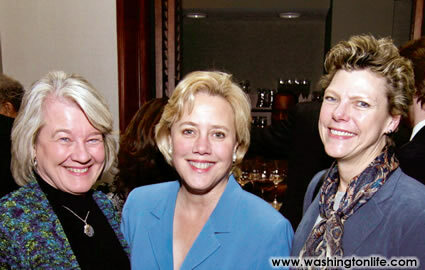 DIANE ROWLAND, SEN. MARY LANDRIEU and COKIE ROBERTS at Acadiana Restaurant for the Friends of The Times- Picayune Fundraiser, which raised more than $30,000 for a relief fund benefiting the newspaper's staff and their families. 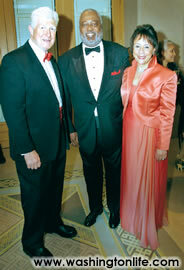 SEN. JIM MORAN, WILLIAM NEWMAN and SHEILA JOHNSON NEWMAN at the Spark a Change Award Gala, held at the Four Seasons Hotel, Washington D.C. Johnson Newman received the award and proceeds from the event benefited Spark a Change. VICTOR LONG, ABBY SHEEZHO, AMY ANGELO and ROBYN BISHOP at MÃ¶et & Chandon and VH1's "Be Fabulous" party, held at K Street Lounge to remind D.C. to be fabulous. 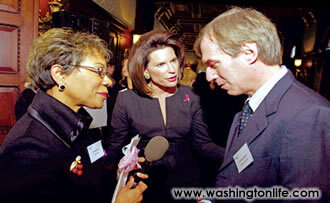 NANCY G. BRINKER (center), chats with ANDREA ROANE of CBS Channel 9 and RICHARDO MASETTI, president of Komen Italia, at the reunion for the 25th anniversary of the Susan G. Komen Breast Cancer Foundation, held at the Library of Congress' Members Room.